Jermaine Jones will get his first taste of the Los Angeles Galaxy-San Jose Earthquakes rivalry when they meet in a preseason game Saturday at Cashman Field. 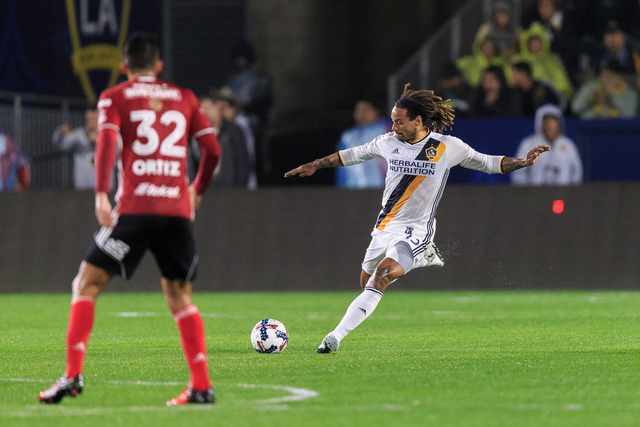 Jermaine Jones made his Los Angeles Galaxy debut on Tuesday against Tijuana Xolos at the StubHub Center. Jones played in the 2014 World Cup with the United States. Courtesy of LA Galaxy. It doesn’t take Jermaine Jones long to adjust to his new surroundings. Jones made an instant impact in his Los Angeles Galaxy debut Tuesday in a preseason match against Club Tijuana. The 35-year-old midfielder did exactly what he does for the U.S. men’s national team as the two-way enforcer in the center of the pitch. Jones’ new teammates raved about his physical presence on defense and ability to create for the offense. “There’s no preseason for me,” said Jones, traded from the Colorado Rapids to the Galaxy in December. “The season has already started, and I want to catch up with my new team. Jones will get his first taste of the Galaxy-San Jose Earthquakes rivalry when the Major League Soccer franchises meet in a preseason game at 7 p.m. Saturday at Cashman Field. This is the second consecutive year the minor league baseball field has hosted the rivalry match known as the California Clasico. Jones has been a full-time U.S. resident for the past three years after leaving the German soccer league to join MLS with the New England Revolution. Jones suits up for the Stars and Stripes, but he was born in Frankfurt, Germany. His mother is German, and his father is from the U.S.
Jones had dreams of playing for the German national team, but only played in four international friendlies from 2004 to 2008. Jones, a top prospect playing in Frankfurt, became frustrated with the German national coaches and decided to join the U.S. in 2010. The midfielder sporting the dreadlocks quickly became a fan favorite for the red, white and blue. He’s competed in 68 international matches for the U.S. and was arguably the best player on the 2014 World Cup squad. Jones is best known for his equalizing goal against Portugal during pool play of the World Cup. He got to face his former teammates in the final pool match, but the U.S. fell to Germany 1-0. Jones is on track to make the 2018 World Cup squad, but he was suspended for the first qualifier match of the year against Honduras in March. Jones provides power on the pitch, but sometimes his aggressive approach leads to too many yellow cards. The Galaxy probably won’t mind the extra toughness if it leads to a sixth MLS Cup title.